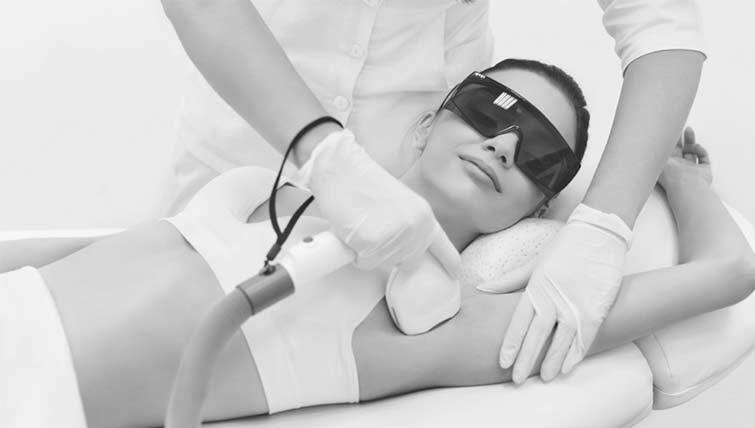 Laser Hair Removal is one of the most popular aesthetic treatments worldwide. “What was once a novel idea seems to now be a sensible convenience”. The best patient for a LHR procedure is fair skinned individual with dark and coarse hair. Having said that this does mean the procedure may not be employed in thin hair and slightly darker skins but in these cases parameters should be judiciously used and the physician should tread cautiously. The coarse, dark hair or the melanin in the hair shaft actually absorbs the laser light and the hair shaft vaporizes and with time the growing phase of the hair cycle decreases making a thick hair become thinner (quite the opposite of waxing and/or threading) and the time in which the hair come back increases. This is what makes the procedure so popular globally. This depends on the area being treated e.g. the face or upper lip may require more frequent sessions, whereas the under arms or legs may require fewer sessions which at more spaced out intervals. Typically 6-8 sessions are required to thin the hair and then maintenance sessions maybe needed to maintain the results achieved. In good scenarios a patient may after the first set of sessions not require LHR for months together or even years depending upon the body part addressed. Why is laser hair reduction (LHR) so popular? a. Gets rid of unwanted hair at odd areas. b. Thins down the hair – LHR helps in thinning the hair down rather than thickening the hair contrary to waxing, threading or plucking. c. No marks after the procedure unlike waxing and threading where you may get marks post procedure. d. Takes care of the ingrown hair – LHR helps in thinning the hair down so potentially a thin hair does not have the ability to grow in the skin, whereas a thicker hair can. Waxing and plucking will lead to aggravation of this problem over time whereas LHR will help it. Currently LHR is considered a gold standard treatment for psuedofolliculitis or ingrown hair. e. Hair reduction for longer periods – The hair free periods with LHR are much longer than with waxing or plucking especially for areas other than the face. f. Relatively painless – There are a lot of advertisements of “painless” LHR – this is not completely true as one has to feel some heat in order for the LHR to be effective, i.e. the feeling of heat suggests that the hair shaft and the stem cells have been heated appropriately and the procedure will be effective. At Dr. Kandhari’s we make every effort to make the patient comfortable during the LHR procedure and the technology we use state of the art “chill tip” technology and make the use of topical anaesthesia is those who are very apprehensive or have low pain thresholds. Dr. Rajat Kandhari is an experienced and well-learned dermatologist in this field, having trained many dermatologists and spoken at various forums regarding this topic. At Dr. Kandhari’s Skin Clinic in Greater Kailash, our state of the art diode technology is a premium high-speed, high power diode laser system for permanent hair reduction equipped with collimated, optical lens, a great chilling tip and a good spot size to give the patient a comfortable and pleasant experience. 1. No waxing, plucking or epilating the hair prior to the procedure – This will take the shaft of the hair out of the follicle which is required for the hair reduction to be successful. 2. No bleaching – The laser targets black hair and bleaching will therefore compromise the results. 3. Shaving is done pre procedure – This does not lead to thicker growth over time as the laser is being used. 4. Pre procedure anaesthesia – Usually not required as the procedure is relatively painless and very comfortable. Certain areas with thick hair and individuals with very low pain thresholds require a numbing cream prior to the procedure. 5. In case of signs and symptoms suggestive of hormonal imbalances the patient may be asked to conduct a few tests to rule out conditions which may lead to unwanted growth of hair. The German technology used at Dr. Kandhari’s Skin Clinic allows for treatment of coarse and fine hair (it has a special mode designed just for fine hair) plus also included the famous “in motion” for less discomfort during treatments and effective, lasting results. The procedure is very comfortable and fast. Diode laser emits highly concentrated impulses of light energy into hair follicles. Pigment present in the hair follicle absorbs the light that penetrates and heats the hair shaft causing its vaporisation. The heating is selective and restricted to the hair follicle thereby decreasing the chances of burns and other side effects. After completion of the procedure, patients are advised to use ice-packs and a good sunscreen. We at Dr. Kandhari’s Skin Clinic make sure that each of our patients understands the process and the very fact that it is a hair reduction process. With numerous salons and quacks offering the procedure we make sure our patients are not mislead regarding the procedure or entrapped with advertisements over promising and under delivering.